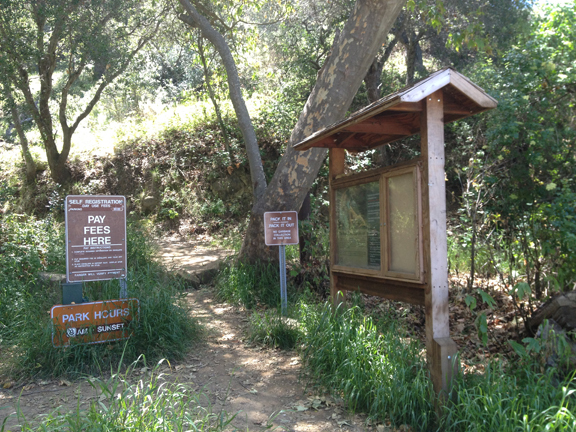 At the trail head a $2 fee is required, and stern warnings are posted about the presence of mountain lions. It is advised that no one travel alone. 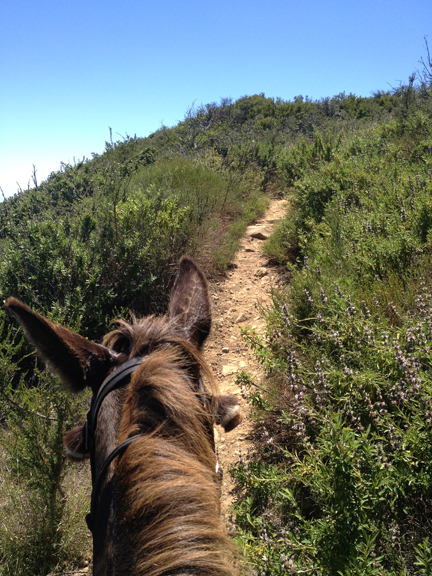 We outfitted the equines with bells and jingled our way onto the trail, heading straight up a 3 mile climb to the top of Gaviota Peak. This is the VERY large staging area, just off the intersection of Hwy 1 and Hwy 101. 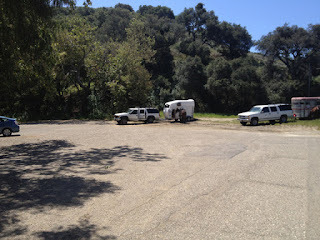 A dozen horse trailers could easily park in it, and it is frequently used by day hikers who park here to use the Gaviota hot springs a short distance up the mountain. 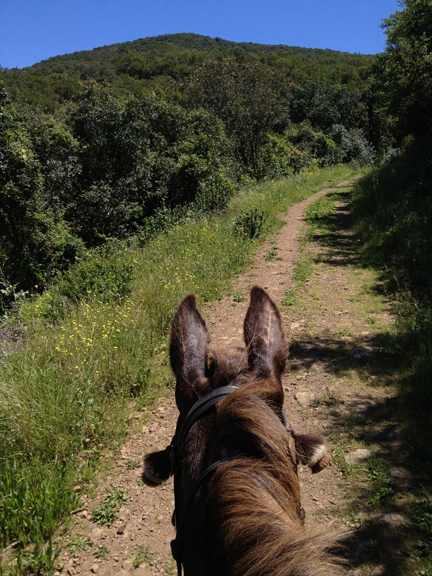 It is a road, not a trail, and only on a very few areas is it not possible to walk with two animals abreast. This is the goal, a peak of the frontcountry range that promises to give a fabulous view up and down coast. In early May the goundcover is still lush and green, and today it was bright and not too hot. 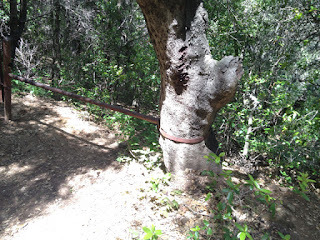 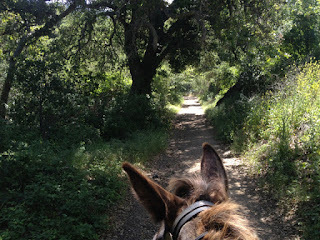 Still it is nice when the trail goes through areas shaded by ancient oaks, very cool. 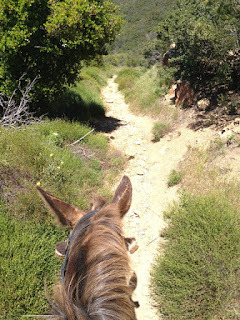 The trail splits into two. 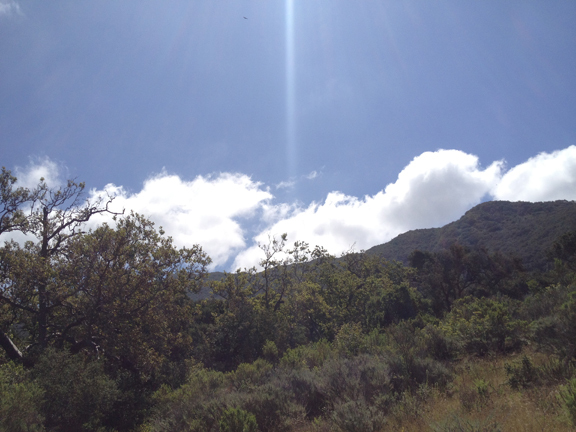 The left one is the one that we will take, that passes the hot springs and continues to the peak. 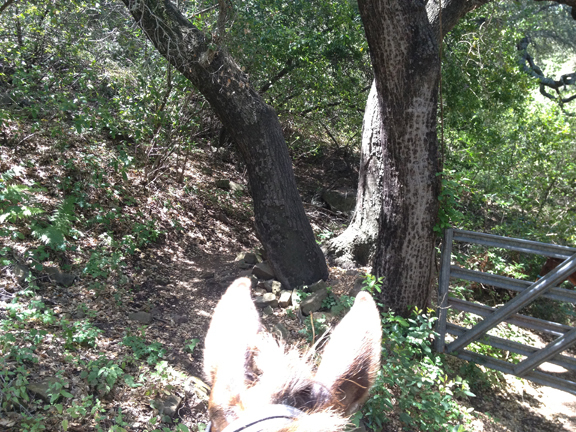 Off to the right is the Trespass Trail, that I rode last year and found it very overgrown.... we cut our way through dense bushes for quite a ways and then turned around. 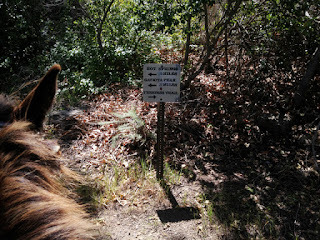 We did not investigate it this day. 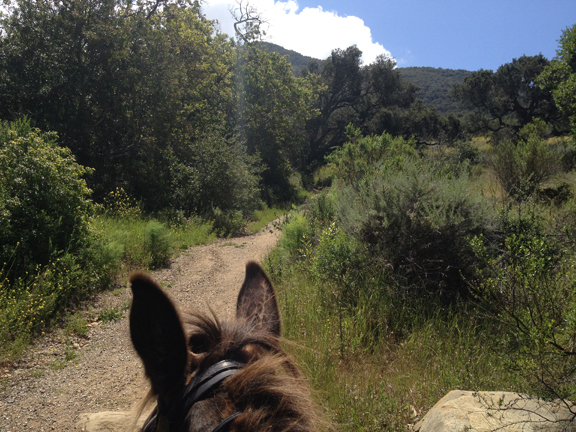 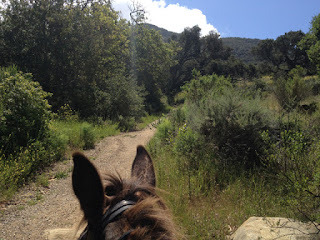 A steady climb is accomplished by sweeping slow switchbacks, easy for an equine in any condition. 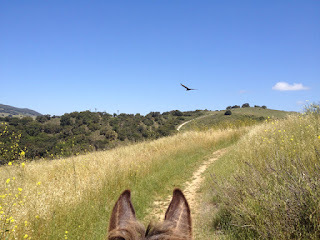 A very large hawk was intent on feeding on ground squirrels in the field and circled overhead. 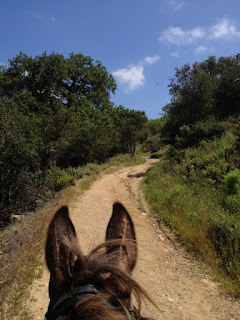 The path continues across the fields, a bit overgrown but always passable. 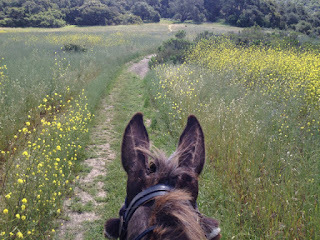 The mustard is still in high bloom, and many tiny spring flowers also. The landscape seems quite natural, the way California has always looked. 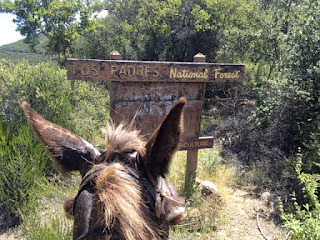 Off to the East is an area still privately ranched. A gate across the trail presumably to inhibit the use of off road machines. 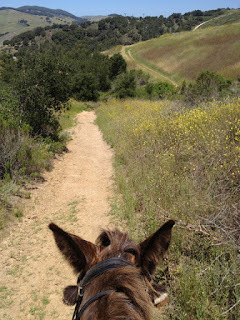 With the hubris of someone used to riding an equine ATV I walked on the left, around the metal bar, because I saw a slim track on the downhill side. Only afterwards when I turned around did I see that a horse path has been carved out of the bank, and circles uphill of the tree. That is the recommended equine trail. 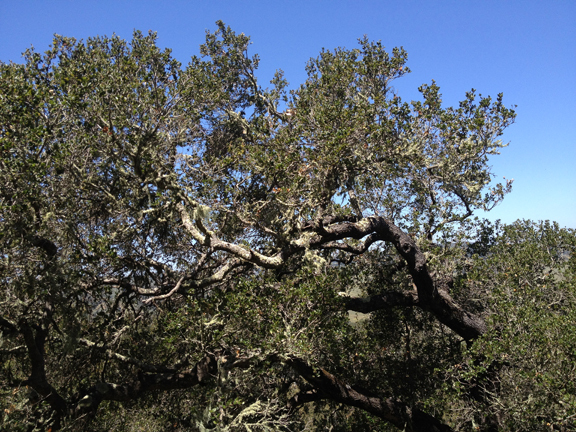 A gnarled ancient oak at the side of the path. A weather-beaten and graffiti covered sign for the Los Padres National Forest. We begin to have vistas. 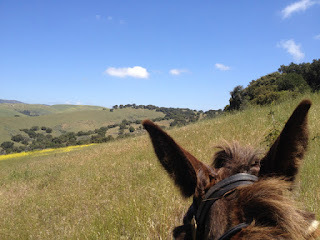 This is looking North, across the Hollister Ranch lands toward Jalama Beach. 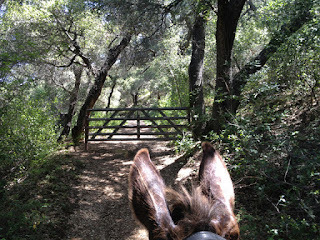 But we have miles to go........... onward and upward. This is looking down to the part of Hwy 1 that branches off from Hwy 101 and goes North toward Lompoc and Vandenburg Air Force Base. Now for the last part of the ascent to the peak it is very steep, single track, and a sweaty push for Mr Mule. 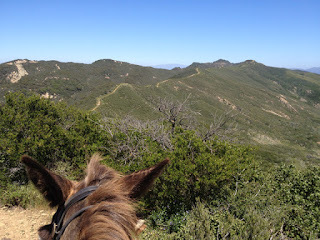 But we have done it, and we can look out over the front range down to the sea, and the Gaviota coastline to the South. 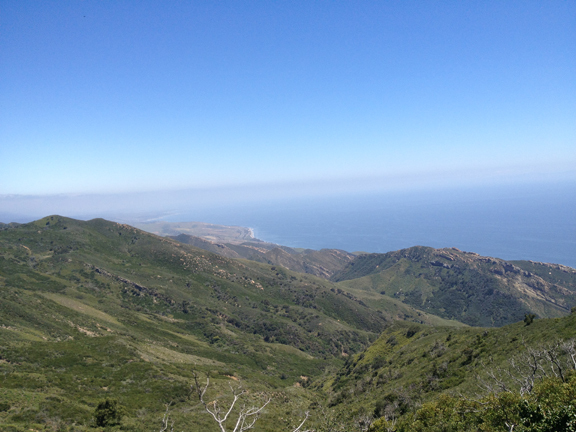 Marine haze and dare we say a bit of Los Angeles smog sully the horizon. Tobe is happy to take a breather, and stands quietly enjoying a treat of carrots as the humans have a snack and a stretch. 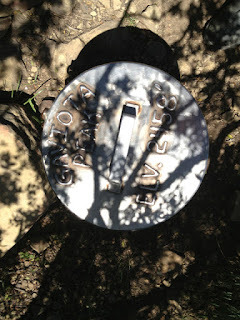 A small metal can holds several notebooks filled with the comments of humans who have been here. 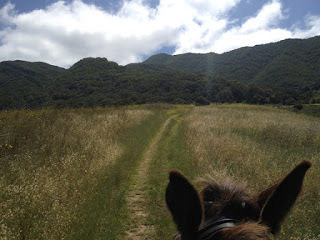 None seemed to have any empty pages so I will plan to start a new one when I return someday. 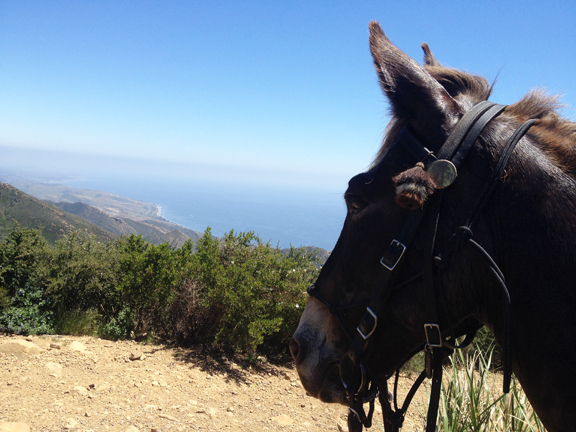 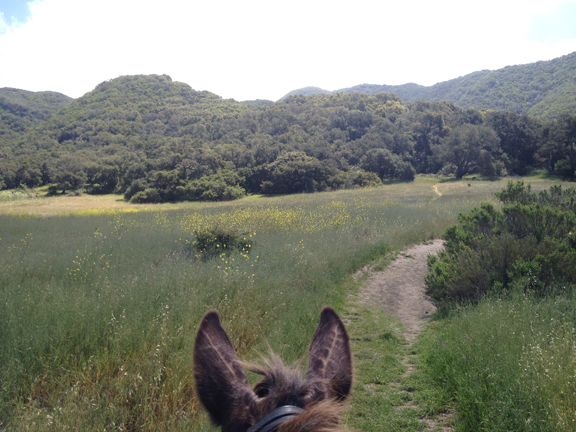 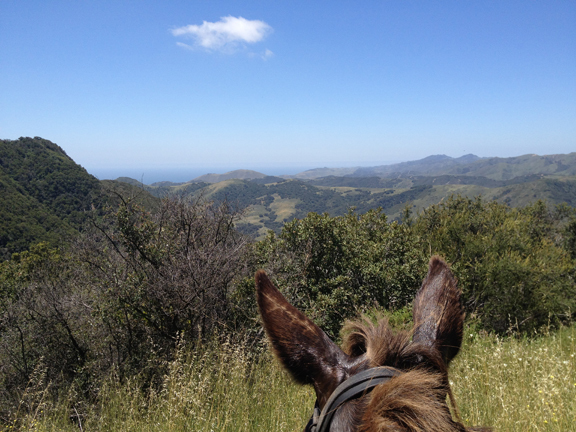 A panorama that shows the trail up, on the left, the ocean view, and my mighty mule Tobe. 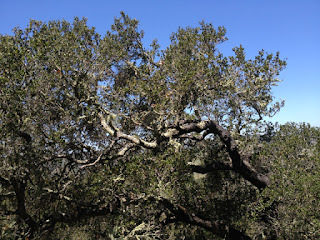 The trail running along the ridge line to the South seems to be the tail of Camino Cielo, and someday I think that would be a fabulous day ride, exploring to see how far we can go on it. The Santa Barbara Trails Council is working hard to clear permissions for all of these coastal trails to connect. 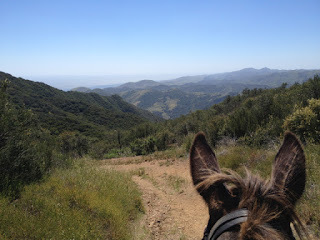 But for now, time to turn around and start the descent. 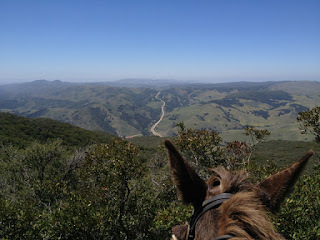 Soon we are back on the wider path, and again looking out to Jalama beach in the far North-West, much obscured by haze. 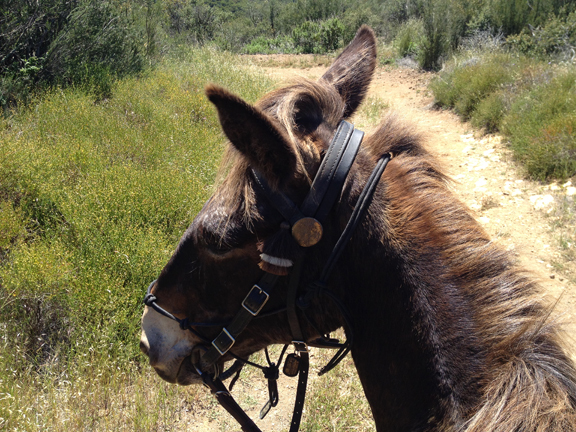 Another happy adventure with the Mule Team!